Intel first started down the path to Smart TV two years ago at IDF alongside Yahoo. The goal was to enable internet connected TVs equipped with Intel CE3100 SoCs running Yahoo powered widgets. You’d get your normal TV viewing experience but you’d be able to pull in content from the web. That partnership didn’t really go anywhere, so when Intel introduced the successor to the CE3100, aptly named the CE4100, Yahoo was nowhere to be found. The CE4100 announcement happened a year after the CE3100 and Intel was light on partner details at the time. Several months later, Google started talking about Google TV and we knew where the CE4100 would eventually find its home. Today the CE4100 is used in a decent number of devices, but not that many when you consider how many netbooks, notebooks and desktop PCs use Intel’s x86 silicon. The Boxee Box and all Google TV products (Logitech Revue, Sony’s Google TV box and the four Sony TVs with integrated Google TV) all run some variant of the CE4100. Intel is expecting two more CE4100 based products to ship in Europe in the near future and over the next 12 months we’ll see even more product launches. Intel’s goal in this space is to put out a new chip every 12 months. The CE4200, announced at this year’s IDF, is the next member of the family and we’ll probably see a CE5100 at IDF 2011. At a high level the CE4100 used in the Boxee Box pairs a 45nm Atom core (architecturally identical to what’s in Moorestown and Atom based netbooks/nettops) with a bunch of CE specific IP blocks. There’s a dual stream 1080p video decoder that can offload H.264, MPEG-2, MPEG-4/DivX and VC-1 decoding at up to 60 fps (hardware accelerated JPEG decoding is also supported). Intel integrates a Tensilica HiFi 2 DSP that can decode everything you’d want to on a set-top box: Dolby Digital 5.1, TrueHD, DTS-HD MA, MP3, AAC and WMA9. As some Boxee users have discovered, MJPEG isn’t supported by the video decode block. Since Atom is a general purpose x86 processor Boxee/D-Link do have the ability to decode MJPEG (or any other codecs) in software, assuming the CPU core is fast enough to handle the task. All the I/O you need is also supported by the CE4100. There’s an integrated NAND controller for on-board solid state storage, 10/100/1000 ethernet support, 2 x 3Gbps SATA ports and 2 USB 2.0 ports. For audio and video you’ve got HDMI, SPDIF and RCA audio outputs. Intel has an on-die security processor that handles all of the DRM and conditional access necessary to enable popular multichannel lossless audio codecs and decode protected video content. 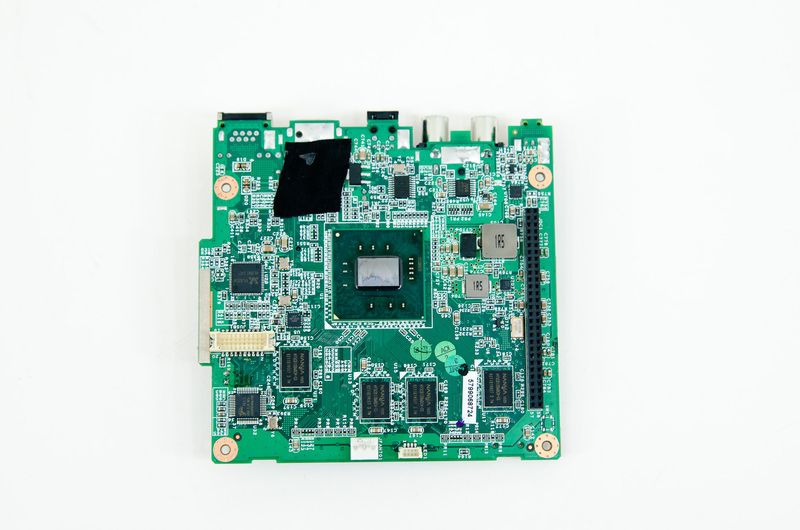 The CE4100 GPU is the same PowerVR SGX 535 used in the MID/smartphone implementations of Atom. It runs at up to 400MHz depending on the particular CE4100 model you’re looking at. Feeding all of the blocks on the CE4100 are two 32-bit DDR2/DDR3 memory controllers. This is 2x the memory bus width of the Atom Z600 series targeted at smartphones and made necessary due to the bandwidth demands of decoding high bitrate 1080p video. It’s unclear what SKUs are used in the Boxee Box and Google TV platforms. Boxee told us there’s a 1.2GHz part inside the Box, so if I had to guess I’d peg it as the CE4110 to keep costs down. Hyper Threading is supported by the underlying architecture but it is not enabled on the first generation of CE4100 SoCs. Next year Intel will ship a new member of the CE4100 family with HT enabled. The CE4100 doesn’t support a number of power management features today. The platform doesn’t support Suspend to RAM (STR), which I noticed in my Boxee testing. There’s no difference in power consumption between an idle Boxee Box and one that’s put to sleep - both consume 11 - 13W of power because STR doesn’t work. Intel plans on enabling STR next year however it’s unclear whether Boxee will be able to backport STR support with a software update or if it’ll need a hardware modification as well. If the latter is true, current Boxee users will likely be out of luck. There’s also no clock or power gating supported on the CE4100, which manifests as higher than expected idle power consumption on the Boxee Box. The lowest I saw was 11.2W when the box was totally idle, which isn’t bad compared to a HTPC but is much worse than your typical streamer boxes. I would expect roughly half that. Without power gating all of the blocks you see in the diagram above are always using power, even when they’re not in use. They may not consume as much power as they would while active, but they are still senselessly snacking on watts. The CE4200, announced at this year’s IDF, adds a few features onto the CE4100 that should make the next version of the Boxee Box even better should Boxee/D-Link choose to use it. The CE4200 adds power and clock gating, which will drive idle power consumption lower. Presumably STR will also be supported in the first releases of the 4200. The CE4200 includes a CableCARD interface and a hardware video encoder that could enable some interesting usage models. Imagine a Boxee Box like device with an iPhone dock that would automatically transcode and let you take your content with you. I asked Intel if it ever plans to offer reference designs to the general public based on the CE4100 or CE4200. While there are licensing issues involved in offering the shipping CE4100 to the general public (e.g. you need to be a DTS license holder), Intel did mention that it may begin offering reference platforms to interested customers/distributors once the Google TV source code is published next summer. Does Apple do above 720p on Apple TV? Did you even read the review? It is all in the Intel CE4100, this is not an Atom this is a complete SoC. "There’s a dual stream 1080p video decoder that can offload H.264, MPEG-2, MPEG-4/DivX and VC-1 decoding at up to 60 fps (hardware accelerated JPEG decoding is also supported). Intel integrates a Tensilica HiFi 2 DSP that can decode everything you’d want to on a set-top box: Dolby Digital 5.1, TrueHD, DTS-HD MA, MP3, AAC and WMA9." You can roll your own SFF PC for near the same price, and get the advantages of having a true HTPC.